Gangtok: Over 40 tourists were among 86 people airlifted from rain-ravaged North Sikkim on Sunday as a large part of the district continued to remain cut off from the rest of the state. The tourists had been confined to hotels since heavy rains lashed the district four days back, causing widespread damage to the road network. "The 112 Mountain Brigade of the Indian Army posted in North Sikkim and the Air Force carried out helicopter services for the stranded tourists and local people. The following numbers of people were evacuated by the helicopters: Chungtang to Gangtok 42 people, Chungthang to Bagdogra 22, Mangan to Gangtok 11, Chaten to Gangtok two and Mangan to Chungthang seven," said a release issued by the North district administration. According to those engaged in the tourism trade, there were not many travellers when the rains lashed North district about five days back. "We are given to understand that 40-odd tourists were evacuated today (Sunday). They were staying at various hotels in North and there was no shortage of food items. Local hotel and transport associations and the district administration were at hand to render all possible help to them," said Barap Namgyal Bhutia, the owner of Sikkim Holidays Trek and Expedition. Neither the administration nor the tourism lobby was able to say if anyone from Bengal was among the airlifted tourists. Among the airlifted local people were either government officials or people in urgent need of transport. "The evacuation of locals was done on a need basis. Among those evacuated were our personnel who had gone to a place located at a height of 17,000ft on mitigation work," said Ganesh Khanal, the joint secretary of the Sikkim disaster management department. The rains have damaged the entire communication network in the district with landslides snapping road links and water washing away bridges and culverts. A huge number of houses have also been fully or partially damaged. 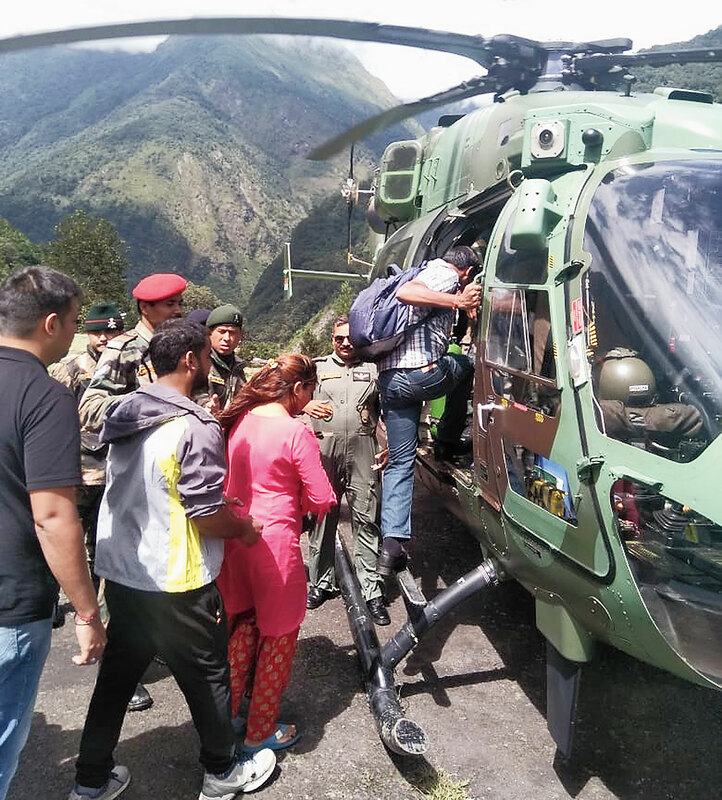 Over 40 tourists were among 86 people airlifted from rain-ravaged North Sikkim on Sunday as a large part of the district continued to remain cut off from the rest of the state.